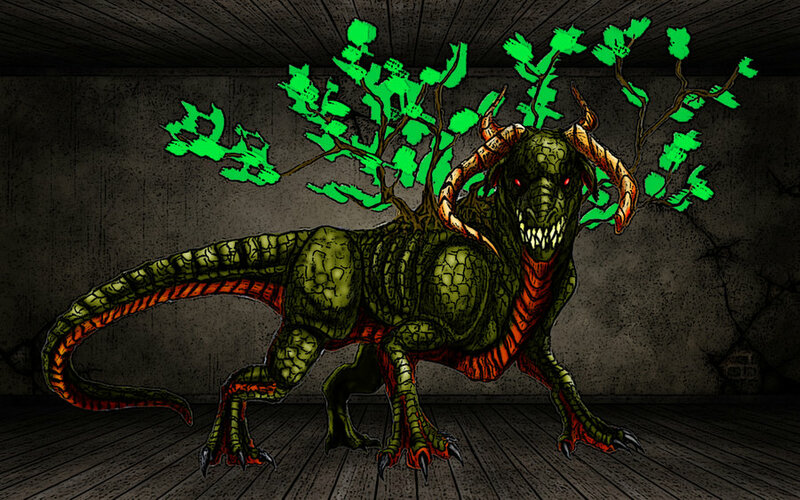 “The dragons of legend are strangely like actual creatures that have lived in the past. They are much like the great reptiles which inhabited the earth long before man is supposed to have appeared on earth. Dragons were generally evil and destructive. Every country had them in its mythology.” (Knox, Wilson, “Dragon,” The World Book Encyclopedia, vol. 5, 1973, p. 265.) 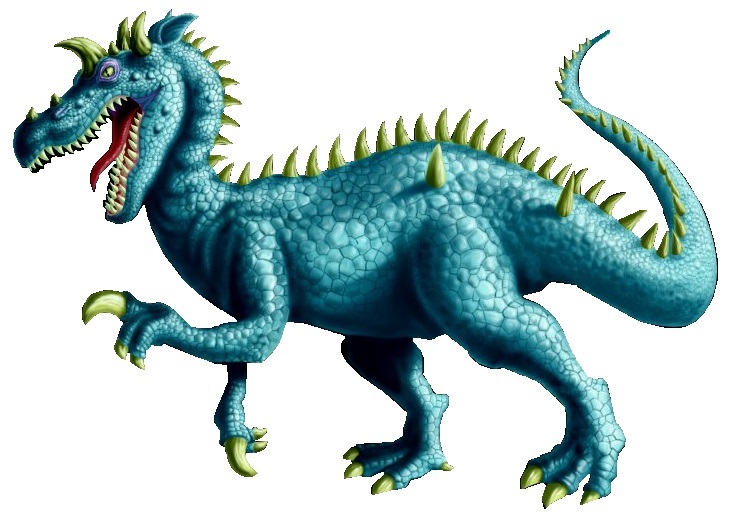 The article on dragons in the Encyclopaedia Britannica (1949 edition) noted that dinosaurs were “astonishingly dragonlike,” even though its author assumed that those ancients who believed in dragons did so “without the slightest knowledge” of dinosaurs. The truth is that the fathers of modern paleontology used the terms “dinosaur” and “dragon” interchangeably for quite some time. Stories of dragons have been handed down for generations in many civilizations. No doubt many of these stories have been exaggerated through the years. But that does not mean they had no original basis in fact. Even some living lizards look like dragons and it is easy to see how a larger variety of such an animal could frighten a community. Have you ever seen an old dinosaur film where they used an iguana in a miniature town set to create the illusion of a great dragon? In 2004 a fascinating dinosaur skull was donated to the Children’s Museum of Indianapolis by three Sioux City, Iowa, residents who found it during a trip to the Hell Creek Formation in South Dakota. The trio are still excavating the site, looking for more of the dinosaur’s bones. Because of its dragon-like head, horns and teeth, the new species was dubbed Dracorex hogwartsia. This name honors the Harry Potter fictional works, which features the Hogwarts School and recently popularized dragons. The dinosaur’s skull mixes spiky horns, bumps and a long muzzle. 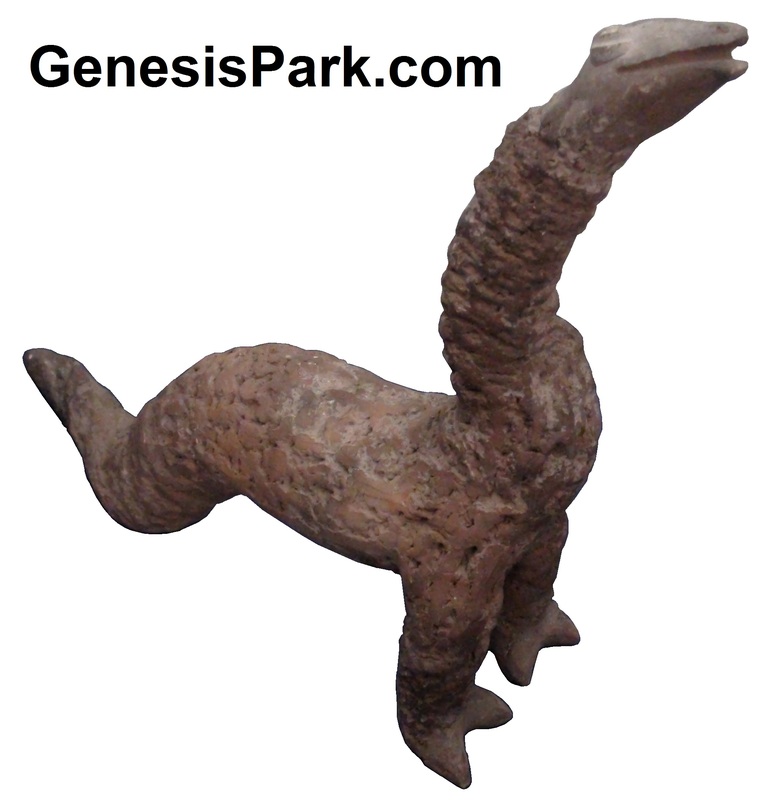 But unlike other members of the pachycephalosaur family, which have domed foreheads, this one is flat-headed. 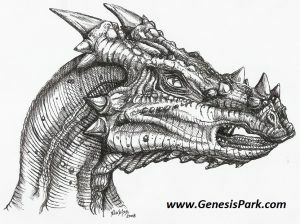 Consider some of the ancient stories of dragons, some fictional and some that might be authentic history of dinosaurs. Daniel was said to kill a dragon in the apocryphal chapters of the Bible. 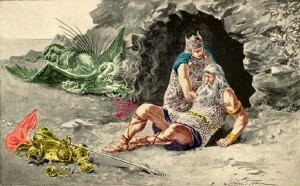 King Cyrus challenged Daniel’s refusal to worship the idol Bel. 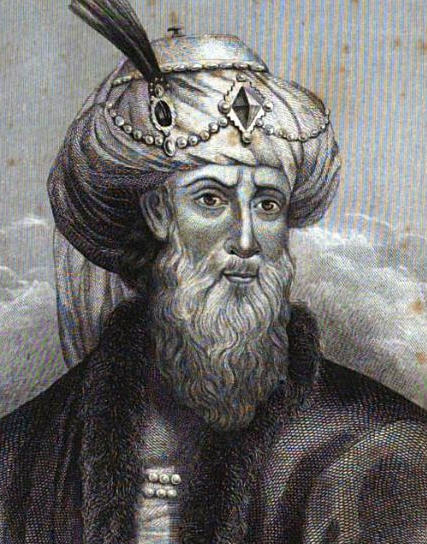 Daniel revealed to the king a conspiracy on the part of the priests to eat the food offered to Bel, making the god seem real. Not only were the deceptive priests executed, but Daniel was allowed to destroy their idol and a dragon that was being worshipped. In the brief narrative of the dragon (14:23-30), Daniel killed the dragon by baking pitch, fat, and hair to make cakes that cause the dragon to burst open upon consumption. In the Hebrew Midrash version, other ingredients serve the purpose of destroying the dragon. After Alexander the Great invaded India he brought back reports of seeing a great hissing dragon living in a cave. Later Greek rulers supposedly brought dragons alive from Ethiopia. (Gould, Charles, Mythical Monsters, W.H. Allen & Co., London, 1886, pp. 382-383.) Microsoft Encarta Encyclopedia (“Dinosaur” entry) explains that the historical references to dinosaur bones may extend as far back as the 5th century BC. In fact, some scholars think that the Greek historian Herodotus was referring to fossilized dinosaur skeletons and eggs when he described griffins guarding nests in central Asia. 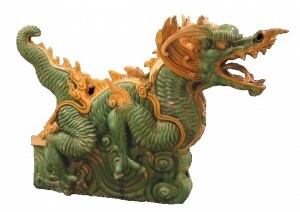 “Dragon bones” mentioned in a 3rd century AD text from China are thought to refer to bones of dinosaurs. Below left is a sculpting of the Bator Dragon. Reliable historical accounts tell of a dragon that was killed in the swamps of what is now Hungary about the year 1035. This fierce reptile had become the scourge of the countryside and was finally destroyed by some brave townspeople. Thereafter the town became known as Bator, which means “Brave” in Hungarian. The Báthory family from of the town became a royal family. Statues near the local Reformed and Catholic churches still commemorate this momentous accomplishment. Three of the dragon’s teeth were kept as mementos of the event. These relics (since lost) were memorialized as the centerpoint of the Báthory seal that is still in use today. Above center is an image of the Wawel Dragon (erected during recent times). 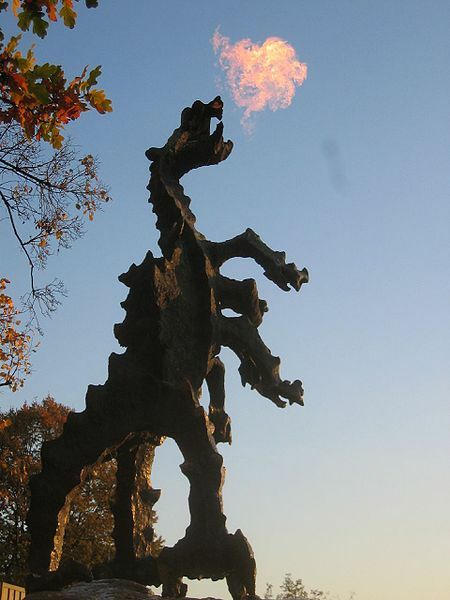 According to legend this dragon lived in a large cave under Wawel Hill in the early 8th century. The cave (which is today a popular tourist attraction) is on the banks of the Vistula river in Kraków, Poland. 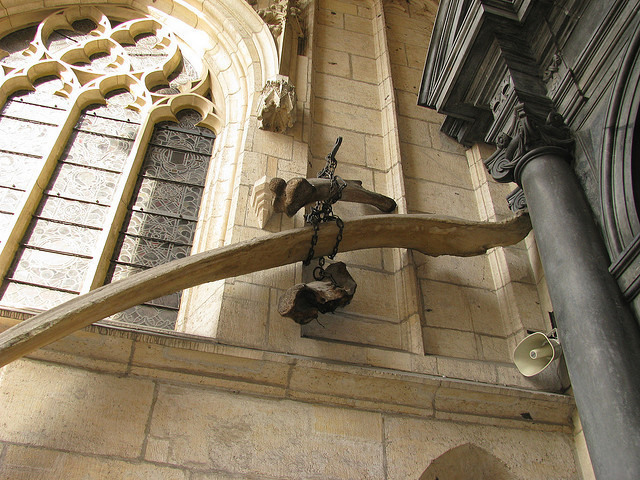 Wawel Cathedral is a 900-year-old Catholic church in the town that still proudly displays (in a hanging bundle) the large bones which are rumored to have belonged to the local dragon. The oldest known account of the Wawel dragon story comes from the 12th century work by Wincenty Kadlubek. It tells how the lair of this oppressive reptile was located near what was then the capital of Poland. According to Polish folklore, the dragon was finally killed by a poor cobbler’s apprentice named Skuba, who cleverly offered the dragon a lamb stuffed with sulphur. Skuba was rewarded with the hand of the king’s daughter in marriage because of his act of deliverance. Charles Gould cites the historian Gesner as saying that, “In 1543, a kind of dragon appeared near Styria, within the confines of Germany, which had feet like lizards, and wings after the fashion of a bat, with an incurable bite… He refers to a description by Scaliger (Scaliger, lib. III. Miscellaneous cap. i, “Winged Serpents,” p. 182.) of a species of serpent four feet long, and as thick as a man’s arm, with cartilaginous wings pendent from the sides. He also mentions Brodeus, of a winged dragon which was brought to Francis, the invincible King of the Gauls, by a countryman who had killed it with a mattock near Sanctones, and which was stated to have been seen by many men of approved reputation, who though it had migrated from transmarine regions by the assistance of the wind. 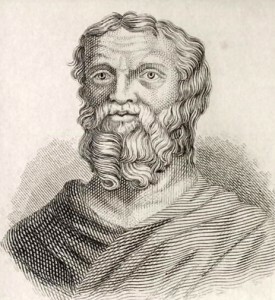 Cardan (De Natura Rerum, lib VII, cap. 29.) states that whilst he resided in Paris he saw five winged dragons in the William Museum; these were biped, and possessed of wings so slender that it was hardly possible that they could fly with them. Cardan doubted their having been fabricated, since they had been sent in vessels at different times, and yet all presented the same remarkable form. Bellonius states that he had seen whole carcases [sic] of winged dragons, carefully prepared, which he considered to be of the same kind as those which fly out of Arabia into Egypt; they were thick about the belly, had two feet, and two wings, whole like those of a bat, and a snake’s tail.” (Gould, Charles, Mythical Monsters, W.H. Allen & Co., London, 1886, pp. 136-138.) 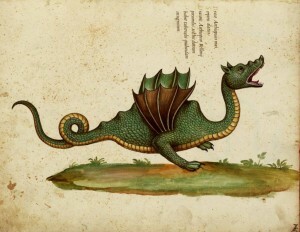 The Italian historian Aldrovandus also claimed to have received in the year 1551 a “true dried Aethiopian dragon” a watercolor of which appears to the left. At first glance, one is tempted agree with Gould that the wings are ridiculously small. But perhaps in transporting from Ethiopia the wings broke off or disintegrated and thus had to be added from the artist’s imagination. The positioning of the wings and the legs is also wrong, unless the “legs” are actually the forelimbs (in which case the wings should be incorporated into the limb) and the legs are actually missing. 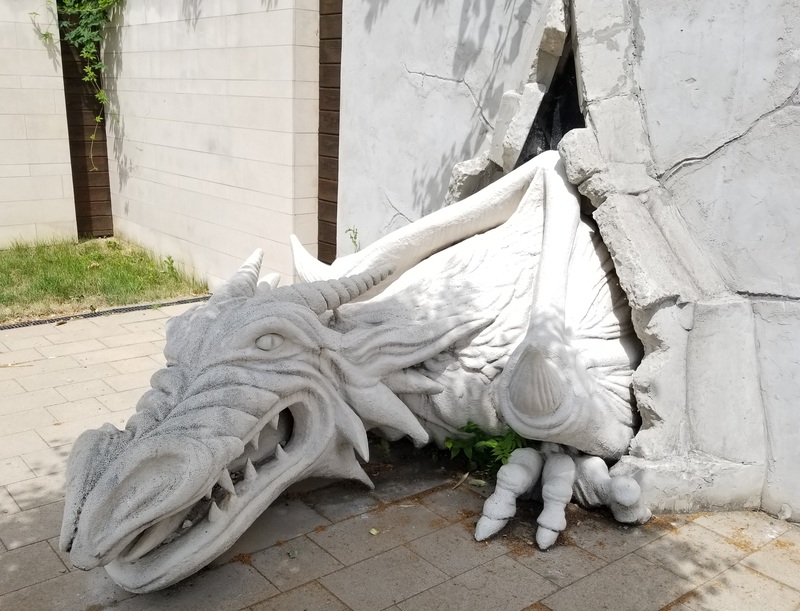 The Chinese have many stories of dragons. Books even tell of Chinese families raising dragons to use their blood for medicines and highly prizing their eggs. (DeVisser, Marinus Willem, The Dragon in China & Japan, 1969.) 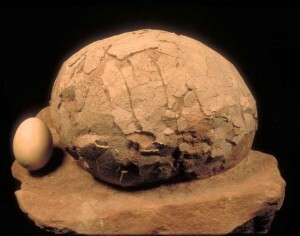 To the right is a pictures of a fossilized Chinese dinosaur egg compared to a chicken egg. Marco Polo wrote of his travels to the province of Karajan and reported on huge serpents, which at the fore part have two short legs, each with three claws. “The jaws are wide enough to swallow a man, the teeth are large and sharp, and their whole appearance is so formidable that neither man, nor any kind of animal can approach them without terror.” (Polo, Marco, The Travels of Marco Polo, 1961, pp. 158-159.) Marco Polo goes on to describe how the local citizens of the area hunted and killed these creatures. He noted that the reptiles were nocturnal (assisted by “eyes larger than a loaf”), dwelling in “caverns” during the day to avoid the heat. After they had killed their prey, Polo wrote that they would find a water source such as a lake, spring, or river. Their massive bodies left “deep impressions” in the paths “as if a heavy beam had been drawn along the sands.” Since the creatures predictably followed these same rutted paths, the natives buried large “wooden stakes tipped with sharp iron spikes, which they cover with sand” (p. 159). Apparently these spikes so severely wounded the creatures that they died soon thereafter. Two-legged dragons are portrayed in ancient Chinese art, like the white carved jade dragon (above right) that is part of the Genesis Park collection. They are also known from other cultures (see below). 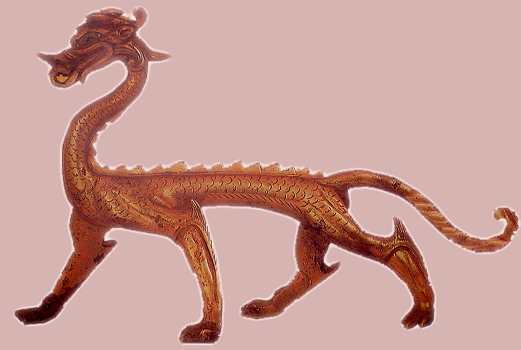 Some of the Chinese dragon art is remarkably like dinosaurs, though often the dragons display an unrealistically narrow trunk…more serpent-like. It is interesting that the twelve signs of the Chinese zodiac are all animals–eleven of which are still alive today. 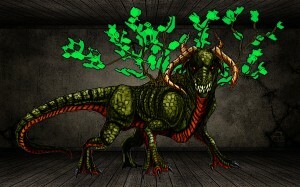 But is the twelfth, the dragon merely a legend or is it based on a real animal– the dinosaur? It doesn’t seem logical that the ancient Chinese, when constructing their zodiac, would include one mythical animal with eleven real animals. 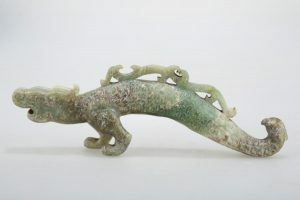 “The interpretation of dinosaurs as dragons goes back more than two thousand years in Chinese culture. They were regarded as sacred, as a symbol of power…” (Zhiming, Doug, Dinosaurs from China, 1988, p. 9.) Shown to the top left is a dragon (click to enlarge) that was cast in red gold and embossed during the Tang Dynasty (618-906 AD). Notice the long neck and tail, the frills, and the lithe stance. Shown above in the middle is a ferocious Ming Dynasty (1368- 1644 AD) dragon statue that is part of the Barakat Gallery Collection. 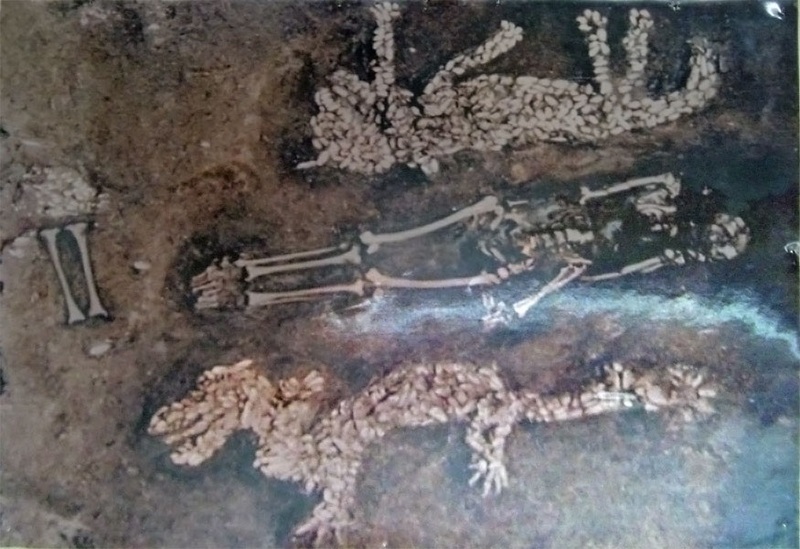 China’s oldest known dragon depiction is a curious discovery found at the ancient Xishuipo Cemetery Ruins along the Yellow River in Henan Province (see right). 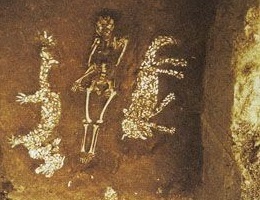 There, three artistic dragons (along with tigers and other animals) composed entirely of white shells were placed alongside human remains. No doubt this indicates a burial place of some very important ruler from the beginnings of the Chinese culture. The Xishuipo site dates back several thousand years, yet the dragons shown are surprisingly like modern renditions. This shows the dragon concept did not slowly develop through Chinese history from a simplistic, primitive mythological figure. This would make sense if they were, in fact, modeled after living creatures. The book Zuozhuan tells the narrative of how the “ancients raised dragons and how the state used the services of two clans known as the Dragon Rearers and the Dragon Tamers.” (Sterckx, R., The Animal and the Daemon in Early China, 2012, p. 52.) Historical records tell of a Song Dynasty (960-1279AD) Emperor who raised dragons within his palace compound. (Niermann, L.D. 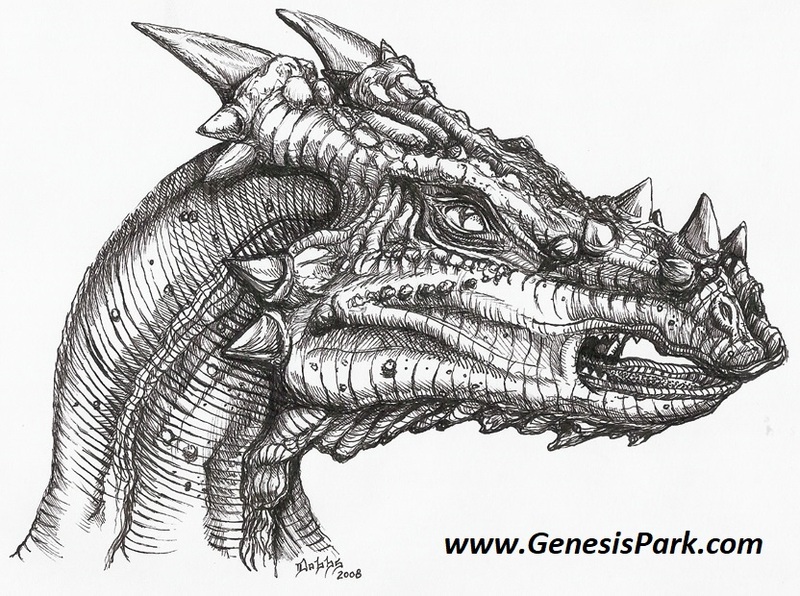 “Dinosaurs and Dragons,” Creation ex Nihilo Technical Journal 8:1, 1994, p. 85-104.) Huang Di, the mythic Yellow Emperor, was said to make sacrifices at the summit of Tai Shan, after driving there in a chariot harnessed to six dragons. (Roberts, Jeremy, Chinese Mythology A to Z, 2004, p. 42.) Ming Dynasty Chinese landscape painter Wu Bin (1573-1620) served for a time as the Emperor’s secretary. 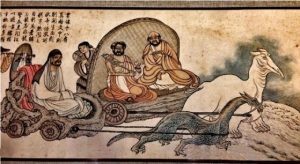 Among his paintings is a piece entitled “Eighteen arhats” (left), an ink and color handscroll showing Chinese dragons pulling carts. But the mythical quality to Wu Bin’s work suggests that dragons had become extinct by his time (hundreds of years after the Song Dynasty). 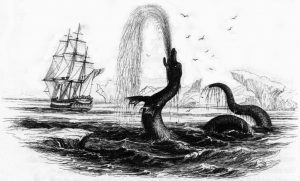 During the Medieval period, the Scandinavians described swimming dragons and the Vikings placed dragons on the front of their ships to scare off the sea monsters. The one pictured to the left is based upon the 1734 sighting by Hans Egede. As a missionary to Greenland, Egede was known as a meticulous recorder of the natural world. Numerous such stories have been recorded from the age of sailing ships (1500-1900 A.D.). The familiar legend of Saint George slaying a dragon is prolific throughout European art and history. Likely it have some basis in fact. St. George is the patron saint of England (though the actual story was brought from the east by the Crusaders). 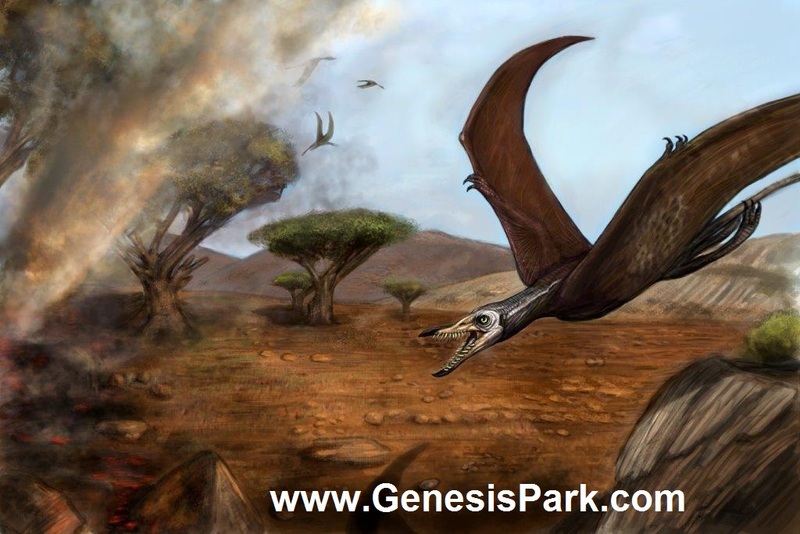 Indeed the “dragon” pictured to the right is the dinosaur Baryonyx, whose skeleton has been found throughout Europe. Ulysses Aldrovandus is considered by many to be the father of modern natural history. He traveled extensively, collected thousands of animals and plants, and created the first ever natural history museum. His impressive collections are still on display at the Bologna University (the world’s oldest university) where they attest to his scholarship. 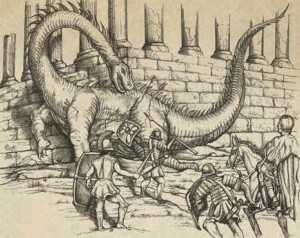 His credentials give credence to an incident that Aldrovandus personally reported concerning a dragon. 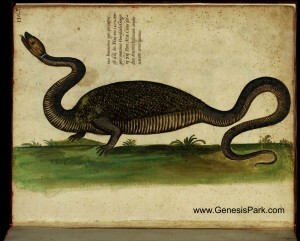 The dragon was first seen on May 13, 1572, hissing like a snake. 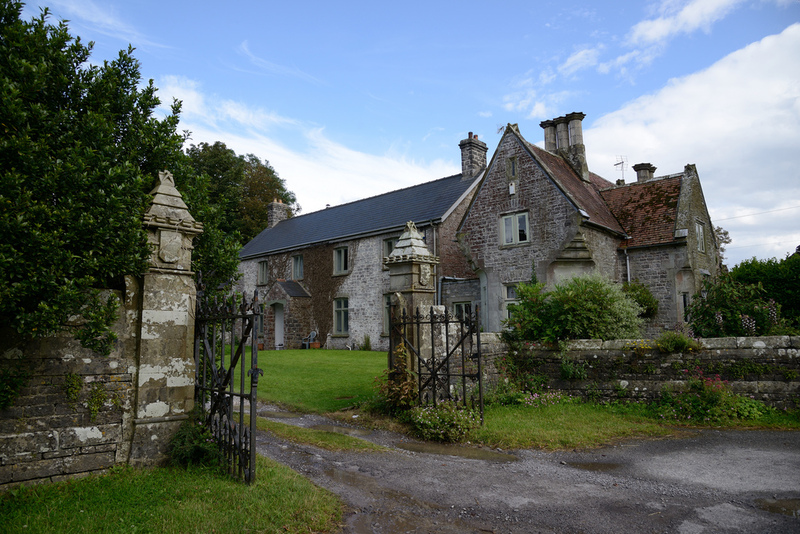 It had been hiding on the small estate of Master Petronius. At 5:00 PM, the dragon was caught on a public roadway by a herdsman named Baptista, near the hedge of a private farm, a mile from the remote city outskirts of Bologna. Baptista was following his ox cart home when he noticed the oxen suddenly come to a stop. He kicked them and shouted at them, but they refused to move and went down on their knees rather than move forward. At this point, the herdsman noticed a hissing sound and was startled to see this strange little dragon ahead of him.Trembling he struck it on the head with his rod and killed it. 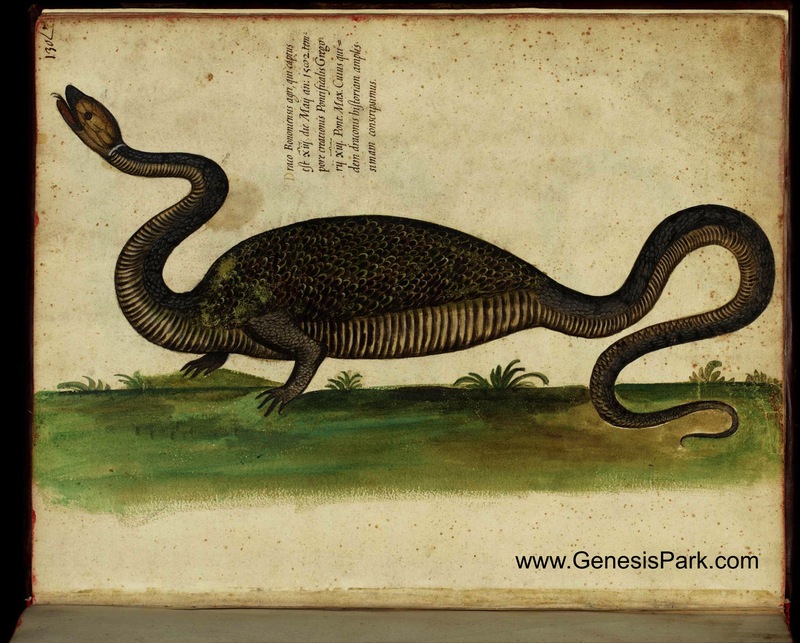 (Aldrovandus, Ulysses, The Natural History of Serpents and Dragons, 1640, p.402.) Aldrovandus surmised that dragon was a juvenile, judging by the incompletely developed claws and teeth.The corpse had only two feet and moved both by slithering like a snake and by using its feet, he believed. 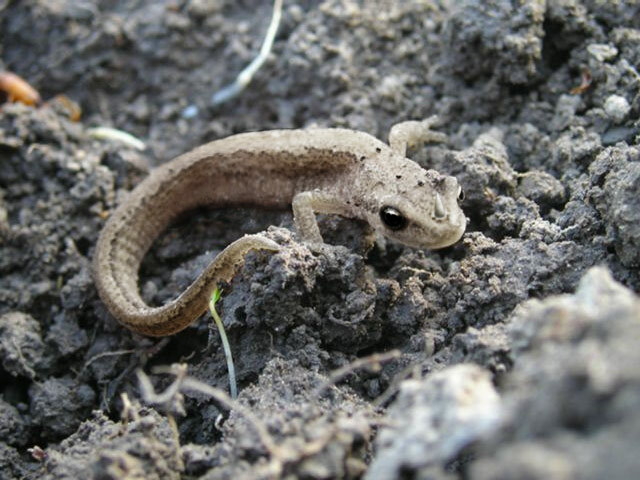 (There are small two-legged lizards that do this today. See below left.) Aldrovandus mounted the specimen and displayed it for some time. He also had a watercolor painting of the creature made (see upper right). Perhaps these two-legged, snake-like dragons had been known for some time in Medieval Europe. 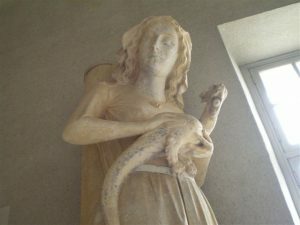 A 13th century statue of Eve and the Serpent displayed at Reims Cathedral in Palais du Tau (below right) displays the same two-legged dragon motif. 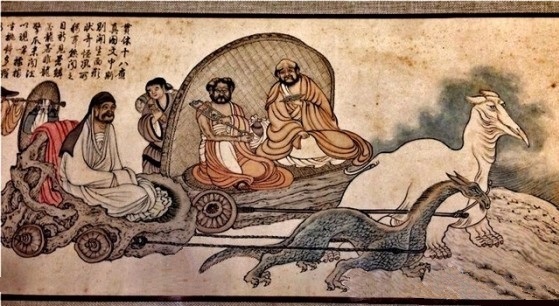 It is interesting to note that two-legged dragons have also been depicted in the ancient Acambaro art found in Mexico (see middle below) and Chinese art (see the Marco Polo dragon report above). In Medieval times, scientifically minded authors produced volumes called “bestiaries,” a compilation of known (and sometimes imaginary) animals accompanied by a moralizing explanation and fascinating pictures. 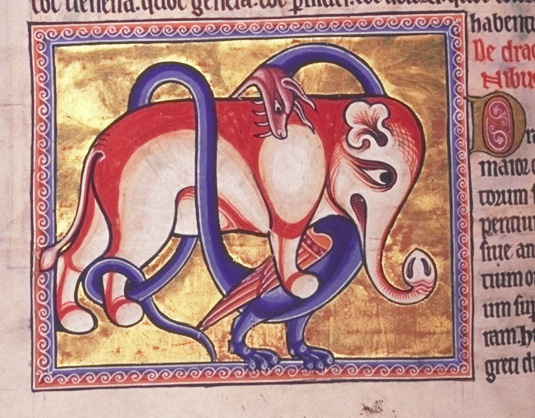 One such volume is the Aberdeen Bestiary, written in the early 1500s and preserved in the library of Henry VIII. Along with the newt, the salamander, and various kinds of snakes is the description and depiction of the dragon: “The dragon is bigger than all other snakes or all other living things on earth. For this reason, the Greeks call it dracon, from this is derived its Latin name draco. The dragon, it is said, is often drawn forth from caves into the open air, causing the air to become turbulent. The dragon has a crest, a small mouth, and narrow blow-holes through which it breathes and puts forth its tongue. Its strength lies not in its teeth but in its tail, and it kills with a blow rather than a bite. It is free from poison. They say that it does not need poison to kill things, because it kills anything around which it wraps its tail. From the dragon not even the elephant, with its huge size, is safe. 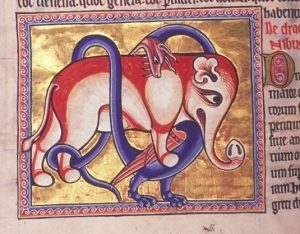 For lurking on paths along which elephants are accustomed to pass, the dragon knots its tail around their legs and kills them by suffocation. Dragons are born in Ethiopia and India, where it is hot all year round.” Flavious Philostratus, the third century historian provided this sober account: “The whole of India is girt with dragons of enormous size; for not only the marshes are full of them, but the mountains as well, and there is not a single ridge without one. Now the marsh kind are sluggish in their habits and are thirty cubits long, and they have no crest standing up on their heads.” (Philostratus, Flavius, The Life of Apollonius of Tyanna, 170 AD.) 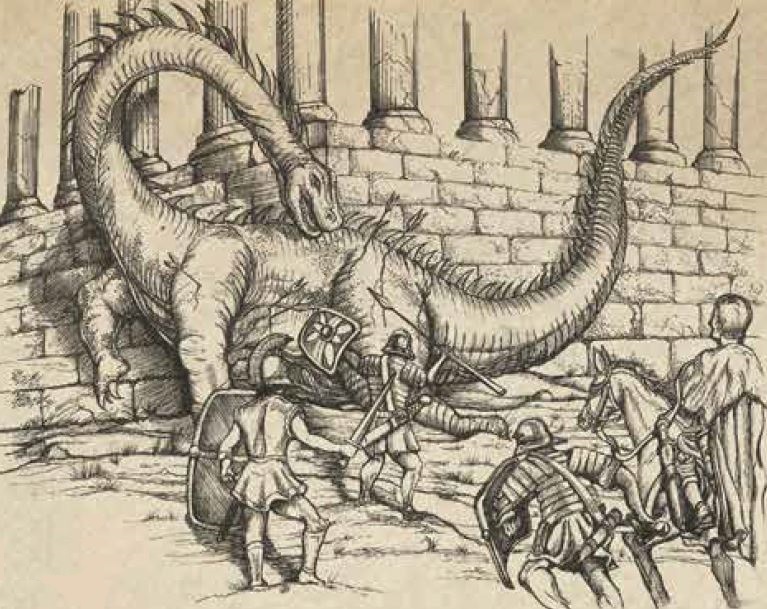 Pliny the Elder also referenced large dragons in India in his Natural History. St. John of Damascus, an eastern monk who wrote in the 8th century, gives a sober account of dragons, insisting that they are mere reptiles and did not have magical powers. He quotes from the Roman historian Dio who chronicled the Roman empire in the second century. It seems Regulus, a Roman consul, fought against Carthage, when a dragon suddenly crept up and settled behind the wall of the Roman army. The Romans killed it, skinned it and sent the hide to the Roman Senate. Dio claimed the hide was measured by order of the senate and found to be one hundred and twenty feet long. It seems unlikely that either Dio or the pious St. John would support an outright fabrication involving a Roman consul and the Senate. The Anglo Saxon Chronicle gives a dire entry for the year 793. (In those days it was common to take glowing, flying dragon activity as an omen of evil to come.) 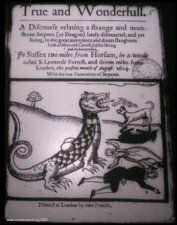 “This year came dreadful fore-warnings over the land of the Northumbrians, terrifying the people most woefully: these were immense sheets of light rushing through the air, and whirlwinds, and fiery, dragons flying across the firmament.” Reliable witness reports of “flying dragons” (pterosaur-like creatures) in Europe are recorded around 1649. (Thorpe, B. Ed., The Anglo Saxon Chronicle, 1861, p.48.) 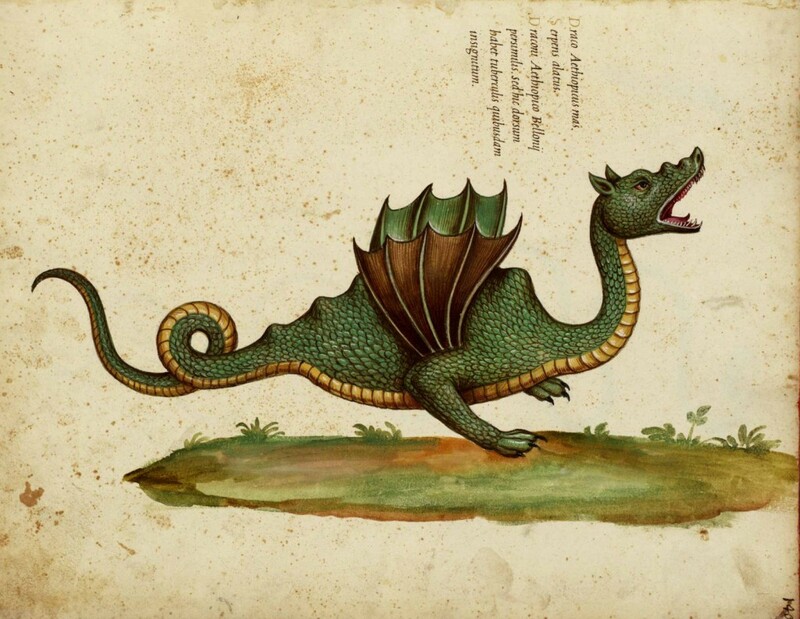 Another early account of a dragon comes from the remarkable book Chronicles of Johannis de Trokelowe and Henrici de Blaneforde, held in the British Museum. This book describes an encounter with a dragon in the eastern part of England (Suffolk County) in 1405. 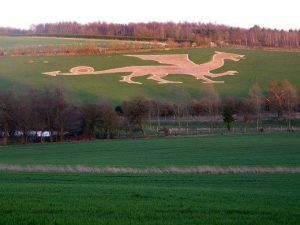 A loose translation of the Latin is: “Close to the town of Bures, near Sudbury, there has lately appeared, to the great hurt of the countryside, a dragon, vast in body, with a crested head, teeth like a saw, and a tail extending to an enormous length. Having slaughtered the shepherd of the flock, it devoured many sheep….In order to destroy him, all the country people around were summoned. 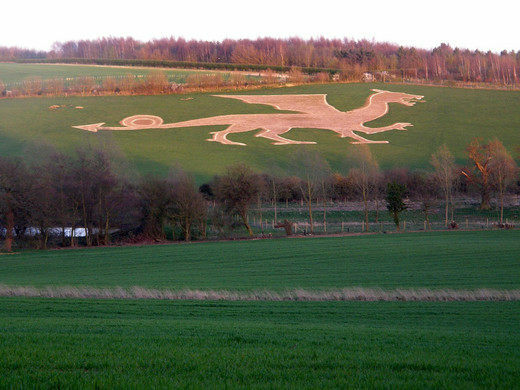 But when the dragon saw that he was again to be assailed with arrows, he fled into a marsh or mere and there hid himself among the long reeds, and was no more seen.” In 2012 an artistic representation of the Bures dragon was made out of white rocks on a grassy hillside, about 1.5 miles out of town. We still have a couple of examples of Medieval dragon booklets, like The Dragon Story shown to the right and Strange News out of Essex or The Winged Serpent. The prolific 17th century writer Athanasius Kircher’s recorded how the noble man, Christopher Schorerum, prefect of the entire territory, “wrote a true history summarizing there all, for by that way, he was able to confirm the truth of the things experienced, and indeed the things truly seen by the eye, written in his own words: ‘On a warm night in 1619, while contemplating the serenity of the heavens, I saw a shining dragon of great size in front of Mt. Pilatus, coming from the opposite side of the lake [or ‘hollow’], a cave that is named Flue [Hogarth-near Lucerne] moving rapidly in an agitated way, seen flying across; It was of a large size, with a long tail, a long neck, a reptile’s head, and ferocious gaping jaws. As it flew it was like iron struck in a forge when pressed together that scatters sparks. At first I thought it was a meteor from what I saw. But after I diligently observed it alone, I understood it was indeed a dragon from the motion of the limbs of the entire body.’ From the writings of a respected clergyman, in fact a dragon truely exists in nature it is amply established.” (Kircher, Athanasius, Mundus Subterraneus, 1664, tr. by Hogarth, “Dragons,” 1979, pp. 179-180.) Such bioluminescent nocturnal flying creatures are known in some regions still today. (See the Ropen page.) Might they not be the basis for the “fiery dragon” lore from ancient civilizations around the world? As western pioneers colonized tribal lands around the world, reports of dragons continued to come back to Europe. It became standard practice for cartographers to identify the unexplored regions at the periphery of their maps with the cryptic words: “Here be dragons!” But as civilization took hold even in remote regions, the changes to the ecosystem and hunting down of predators took its toll on the remaining dinosaurian remnants. 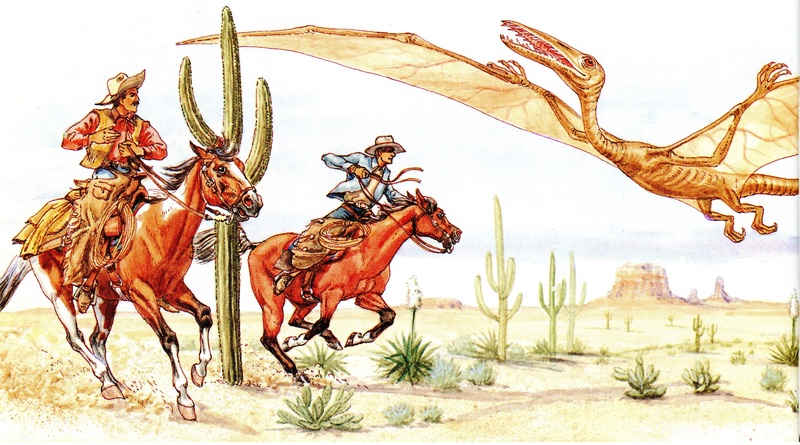 On April 26, 1890 the Tombstone Epitaph (a local Arizona newspaper) reported that two cowboys had discovered and shot down a creature – described as a “winged dragon” – which resembled a pterodactyl, only MUCH larger. The cowboys said its wingspan was 160 feet, and that its body was more than four feet wide and 92 feet long. The cowboys supposedly cut off the end of the wing to prove the existence of the creature. The paper’s description of the animal fits the Quetzelcoatlus, whose fossils were found in Texas. (Gish, Dinosaurs by Design, 1992, p. 16.) Could this be thunderbird or Wakinyan, the jagged-winged, fierce-toothed flying creature of Sioux American Indian legend? This thunderbird supposedly lived in a cave on a mountaintop and feasted on seafood. Larger than the eagle (Wanbli) or hawk (Cetan), the Wakinyan was named because of its association with thunder and lightning–supposedly being struck by lightning and seen to fall to the ground during a storm. (Geis, Darlene, Dinosaurs & Other Prehistoric Animals, 1959, p. 9.) It was further distinguished by its piercing cry and thunderous beating wings (Lame Deer’s 1969 interview). Evolutionist Adrienne Mayor spent considerable time researching the possibility that Native Americans dug up dinosaur fossils. But some of the reports she received make a lot more sense if these early Americans interacted with actual dinosaurs, not yet extinct. There is no evidence for sophisticated Ancient Paleontologists. An old Assiniboine story tells of a war party that “traveled a long distance to unfamiliar lands and [saw] some large lizards. The warriors held a council and discussed what they knew about those strange creatures. They decided that those big lizards were bad medicine and should be left alone. However, one warrior who wanted more war honors said that he was not afraid of those animals and would kill one. 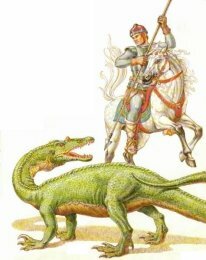 He took his lance [a very old weapon used before horses] and charged one of the large lizard type animals and tried to kill it. But he had trouble sticking his lance in the creature’s hide and during the battle he himself was killed and eaten.” (Mayor, Fossil Legends of the First Americans, 2005, p. 294.) This story conjures up credible visions of the scaly hide of a great reptile, something Native Americans would not know from mere skeletons. It was once thought that Woolly Mammoths had flourished in North America prior to the arrival of humans. But the discovery of sites where many mammoths were killed and butchered has established the co-existence of men and mammoths. Perhaps similar evidence involving dinosaurs will be forthcoming. The atheistic astronomer Carl Sagan once remarked: “The pervasiveness of dragon myths in the folk legends of many cultures is probably no accident” (Sagan, Carl, The Dragons of Eden, New York: Random House, 1977, p. 149). Indeed he felt compelled to address the similarity to the great reptiles of the Jurassic era and “explain them away.” How could Sagan do this? 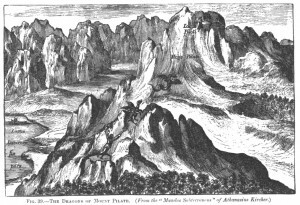 Peter Dickinson stated, “Carl Sagan tried to account for the spread and consistency of dragon legends by saying that they are fossil memories of the time of the dinosaurs, come down to us through a general mammalian memory inherited from the early mammals, our ancestors, who had to compete with the great predatory lizards.” (Dickinson, Peter, The Flight of Dragons, New York: Harper and Row, 1979, p. 127). Thus Carl Sagan believed that we evolved not merely our physical bodies, but also memories “uploaded” from our mammalian ancestors!